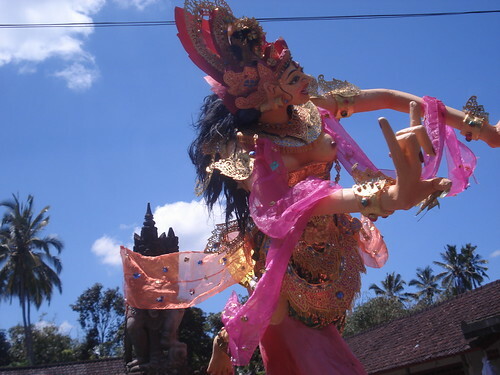 Day 3 of our Bali trip was Nyepi, the day of total silence. Its when no one is allowed outdoors or make any noise or turn on any lights for an entire day. 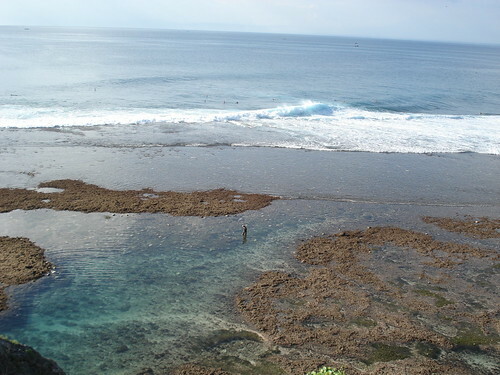 The legend says it is to fool the evil spirits visiting on this day (the Bali Hindu New Year) that there is no one on the island, and they will leave the island free from disasters for one year. But this ruling is hardly enforced in tourist hotels, so we all had great fun the whole day. 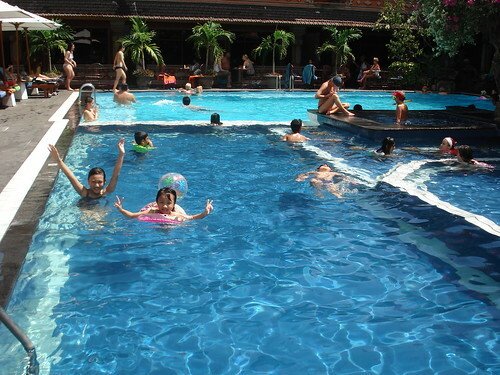 The kids made a big splash in the 2 swimming pools in the morning and evenings. For me, other than sleeping in and eating, i snuggled up in the cool hotel room finishing my Cormac McCarthy book. We also had our spa treatment. 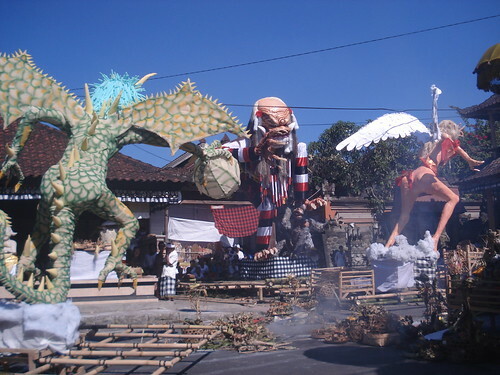 On the night before Nyepi, the boys in every village try to outdo each other by building large effigies of demons and villains. In the evening, these effigies will be carried to the beach or graveyard to be burnt. Sometimes the villagers built funny effigies – cartoon characters and even drunk tourists. The effigies (called Ogoh-ogoh) are quite impressive, some have motorized parts that move, all in all we saw almost a hundred different ones throughout the few days. So after a very restful (for me lah) third day, we set out early again on the 4th day. 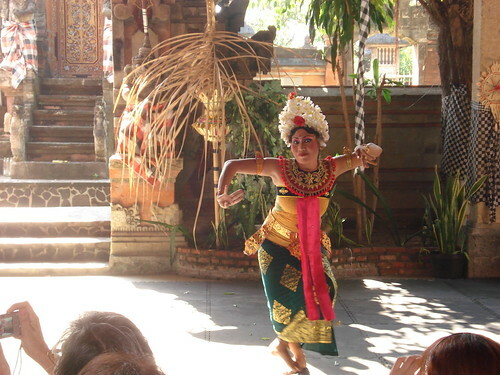 First stop was Batubulan, a small village between Kuta and Ubud, to watch the Barong dance. 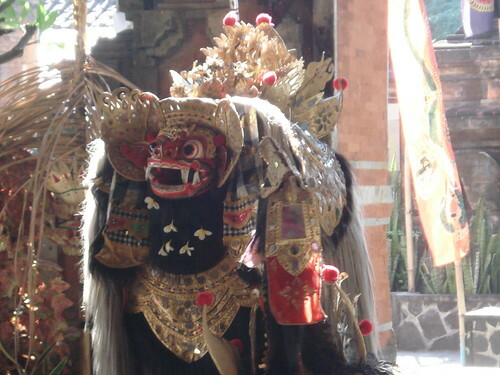 Barong is an amusing tale mixed with some modern humour elements about mythical elements, demons and the common folk. Worth a visit if you have the time, altho the entrance fee of Rp80,000 is a little pricey. Lady doing that weird thing with her eyes during the dance. Then we wanted to do some serious shopping. Our driver took us to the Artist Market in Sukawati. 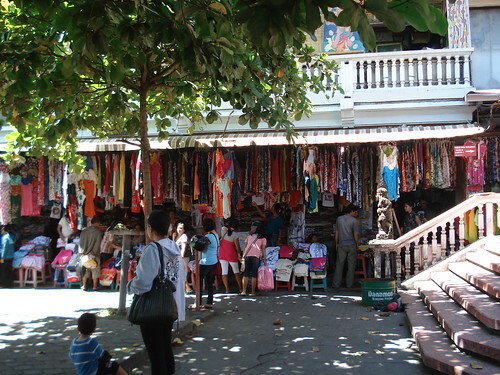 This market is targeted to locals (although there are still some tourists here) so the prices far cheaper than anywhere else. 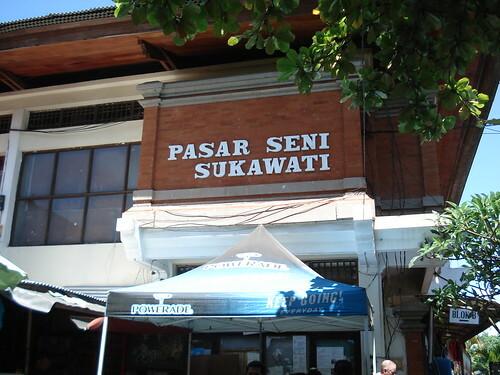 If you’re planning to shop, forget about Kuta or Legian or Ubud, come here first. A word of warning tho, the inside of the market is cramped and stuffy. So if you’re averse to it, stick to the perimeter shops outside. But you’ll be sweating anyway, why not just dive indoors to get that killer bargain. With all that energy expended for shopping, we were hungry for grub. 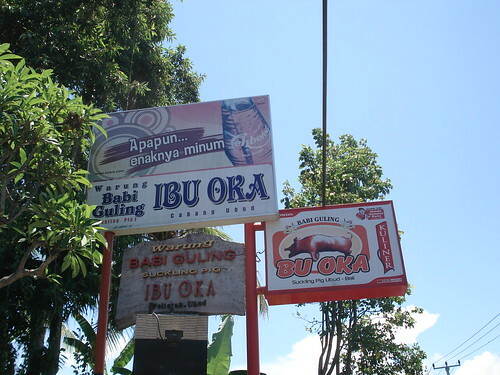 Lunch was at the most famous makan stall in all of Bali – Ibu Oka Babi Guling. We didnt go to the cramped original stall opposite the Royal Palace, we went straight to the newer (and more comfortable) branch in Peliatan outside Ubud. Herbed meat, crispy skin, deep fried innards. Mmmm… (also tried the Tosro bottled tea here). After lunch we went downtown Ubud, while the gang went to the Art Market in Ubud, i went opposite to check out the Puri Saren Agung, the Royal Palace and Temple. For a royal palace its pretty small. 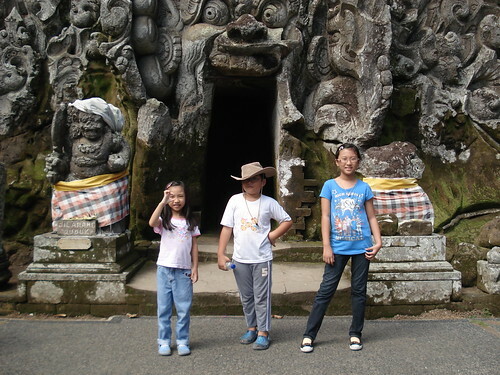 Then a quick trip to Goa Gajah. 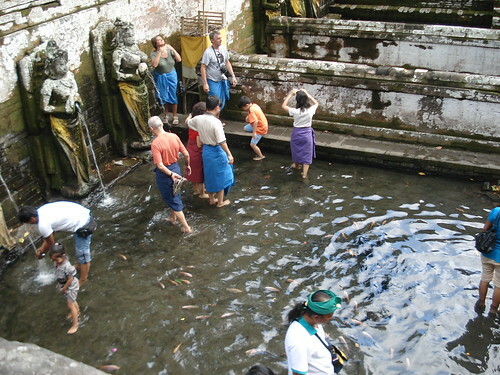 Those are people dipping in the holy water. The three musketeers posing at the mouth of the Elephant Cave. 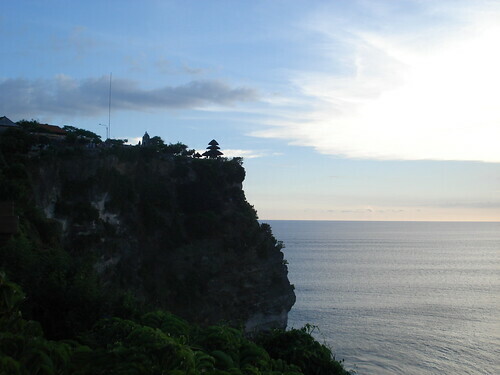 Then it was to the Uluwatu temple (Pura Luhur Uluwatu). Anyone who’s been here will tell you about the rowdy monkeys. Make sure you don’t enter without your guide. Ours was armed with a 5-foot stick. But the walk in was pretty well-rewarded. The temple at sunset is beautiful. For our last dinner in Bali, we did one of the requisites – candlight dinner in Jimbaran. The stretch of beach from the south up to near the airport is lined with dozens of seaside restaurants, ranging from the authentic to the ultimate rip-offs. We had planned to try Lia’s Cafe based on online reviews, but our driver recommended us to check out Sharkey’s. It looked pretty good so tried it. 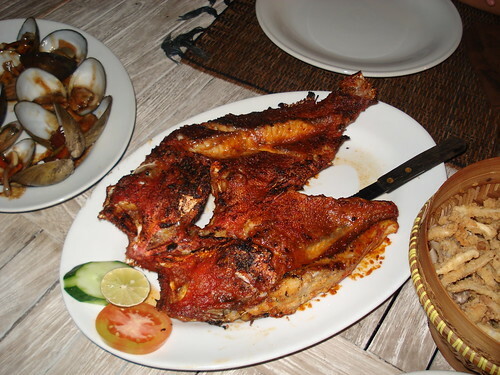 It turned out to be a great place, we had the fish, calamari, flame grilled chicken served with kangkung and rice. Came up to RM175 for 7 of us. And the band serenading us was pretty good (altho their pronounciation was atrocious). So after a long day we were glad to reach the hotel. Next – Last day on Bali. Clap clap clap… nice trip itinerary! Think it was planned very well..and your kids are quite adventurous! no complaints of the heat? Mmm..just thinking of ibu oka… I sat in the cramped restaurant.. i had no kids with me.. enjoyed it tremendously! 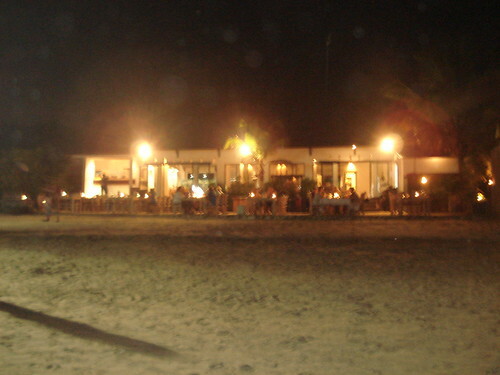 U can also try mama dony’s at jimbaran next time. it’s the last stall on the beach..and VERY much cheaper! yeah i think we did so much planning it was over-researched. but with the time and effort, our driver was also great in helping out in the tiny details. 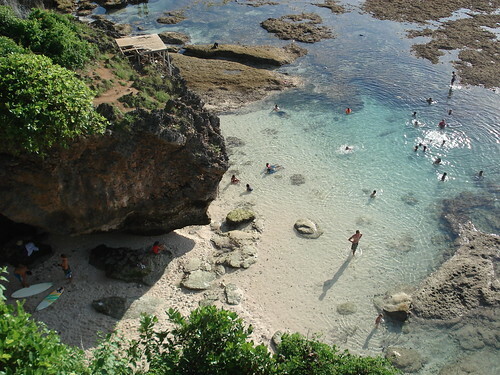 Bali w/o kids must have been fun for you! hey there, this reminded me to quickly finish my posts on Bali. Hahaha .. half year on and I’m still procrastinating. j2kfm, i’ve actually been reading your travelogue a lot in prep for my trip! your pics were really good. Hello there, Happy Fool’s Day! But it looks like they can be. Although the meat itself which was served piping hot, was fairly underwhelming but flavorful enough, the crackling was still as tough as old leather shoes! It really made my DW and me wonder whether those folks who write glowing reviews of Ibu Oka and their babi guling, including Anthony Bourdain and the travel writer from Lonely Planet have ever tasted suckling pig in a Chinese restaurant? If they have, they would have tasted exactly how good suckling pig should taste like with crackling so crispy thin that every bite is to be savored! It is highly unlikely that after that, they would ever venture to describe babi guling as â€œamazingâ€, “fantastic”, â€œbest everâ€ and all the silly hyperbole that have come to dominate this debate and given Ibu Oka an undeserved reputation. I have nothing against Ibu Oka per se. It is the integrity of reviews that Iâ€™m concerned about! To draw an analogy, if you live in a small outpost, say in the far reaches of Siberia, you may describe your local football outfit as â€œamazingâ€, â€œbest in the worldâ€ or whatever superlative terms you may wish to employ, not out of intellectual dishonesty, but only because you have never been exposed to the silky skills of the likes of Barcelona or Manchester United. That is probably how it is with this â€œamazing babi gulingâ€ nonsense! We were in Shanghai for 9 days and tried Peking Duck and suckling pig IN SEVERAL RESTAURANTS and the stuff that they served up were slices of culinary heaven!! As we live in San Francisco, we have developed an affinity for the dish. We know that everyone is entitled to their opinion. But how do you judge a dish when you havenâ€™t tasted even remotely the best? It is really like the uncultured and the philistine trying to pontificate on high-brow literature and classical music! I am a fan of Anthony Bourdain and look forward to his witty presentations. However, on this occasion he has dropped the baton big time! Come to think of it, I have never heard Bourdain describe any dish he is reviewing without using superlative terms. If he continues at this rate, his credibility will soon be shot! We remain baffled over these superlative reviews, because when we compare Ibu Okaâ€™s babi guling to the suckling pig we have tasted in Chinese Restaurants from this side of San Francisco to Melbourne to Hong Kong to Singapore and Bayswater in London, we have to say that if the Chinese version and Ibu Okaâ€™s babi guling are compared and placed on a scale of 1-100, the Chinese version would easily place near a hundred and Ibu Okaâ€™s would limp in below minus 10. That is the difference between a culture with 2,000 plus years of culinary development and a rank amateur!